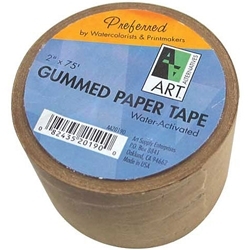 Gummed Paper tape is an acid-free medium-weight kraft paper that is coated with water-activated gum on one side. It is widely preferred by watercolorists and printmakers for its ability to adhere damp paper to a backing board tightly and securely. Each roll measures 2" x 75'.